Busy parents shouldn't mean the family has to eat fast food or frozen meals every night. 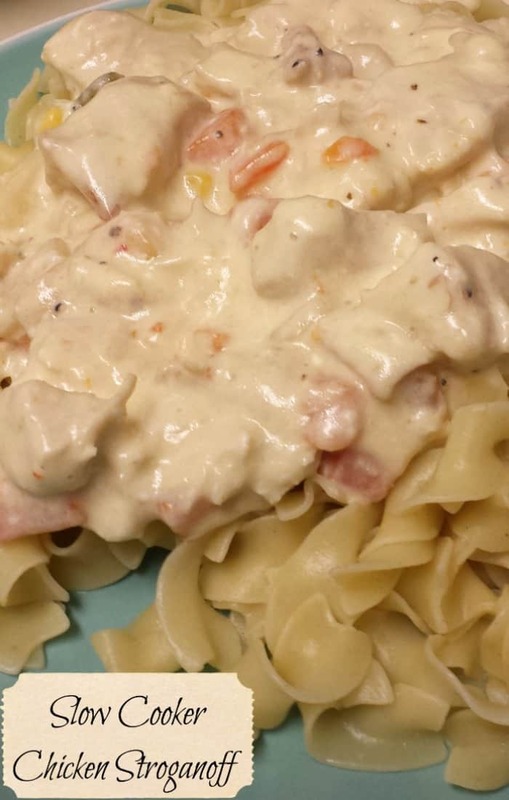 This recipe for Slow Cooker Chicken Stroganoff that you prepare in your slow cooker is perfect for a hot, delicious meal the whole family will enjoy! I went on the hunt for something delicious that could cook in my slow cooker during the day and need little attention but not taste bland or overcooked. Boy did I find what I was looking for in this dish! Oh, and don't be concerned about the lack of “wet” ingredients in the cooking stage. Our chicken was melt in your mouth tender! Mix until the chicken is well coated. Add the cream cheese, mixed vegetables and can of soup and cook on high for 30 minutes. We've already discovered different ways to really play to my family's tastes in this easy dish! * When you're short on time, this recipe can be cooked on your high setting in 2-3 hours! Looks great, I’m ALWAYS looking for new crock pot recipes, just pinned, thanks for sharing! Thanks so much for sharing your great recipe with Full Plate Thursday and enjoy your Thanksgiving week! Sounds yummy and so moist! Thanks for sharing on the Living with Style Linky Party!